We hosted the sixth NEWS event as part of our Deteriorating Patient Programme on 28 September 2017 at Kings Weston House in Bristol. 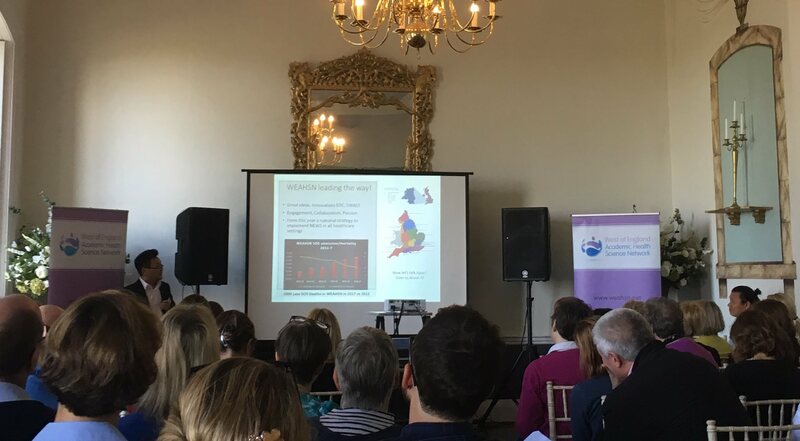 Attended by 80 delegates from 36 different organisations, all six acute trusts in the West of England were represented, along with community providers, mental health providers and care homes. We have been working on implementing the National Early Warning Score (NEWS) across our urgent care system since 2014. Our aim is to improve patient safety by earlier recognition of the deteriorating patient, particularly those at risk of developing sepsis. We have made excellent progress and are currently evaluating our outcomes. The first year of the programme focused on the implementation of NEWS in all settings and using NEWS accurately. Year two was focused on using NEWS at handover of care, while year three is about evaluation and looking at the national picture. The focus of this event was to explore what is happening with NEWS nationally, as well as the need to provide evidence on how the region has successfully adopted NEWS across all care settings. A full report on the event, which was structured as an ‘Open Space’ to allow a democratic sharing of ideas and experiences, is available to download here.